Did you know that twitter is a great source for college advice, giving you direct access to pros who can advise you about all stages of the financial aid process? If you decide you’d like to use twitter for your college search process, you might like to follow hashtags like #collegecash, #fachat, #campuschat, #collegechat, and #emchat. Jodi Okun is the founder of College Financial Aid Advisors. She has successfully helped thousands of families navigate the financial aid process. Her expertise parallels her passion and has made her a top influencer in the financial aid industry. 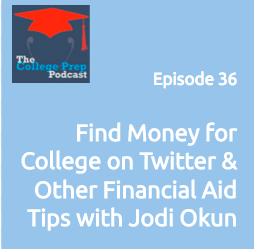 Jodi’s background includes over ten years in the financial aid industry. She is a former Financial Aid Consultant at Occidental College and Pitzer College. Through Jodi’s large and loyal Twitter following, she has organically incorporated philanthropy into her brand. Every Thursday at 5pm PST, Jodi hosts #CollegeCash: a Twitter chat devoted to connecting college-bound families with higher education professionals. On average, #CollegeCash receives more than ten million impressions per week, making it a top resource for parents and students.